Educational-Scientific-Production Complex «ZhDU — PAT «Electrovymiryuvach» was created on the basis of Zhytomyr Ivan Franko State University and one of the leading enterprises of Zhytomyr PAT «Electrovymiriuvach» in order to implement scientific research results in production according to the order confirmed by the Ministry of Education and Science of Ukraine № 27 from 17.01.2004. As a result the teaching equipment for the physical laboratories of comprehensive schools which was created by at the university Physics Department is produced by the private stock company PAT «Electrovymiriuvach». Since 2005 the complex has been participating in the Government Complex Program «The Provision of Comprehensive and Vocational Schools and Higher Educational Institutions with Modern Teaching Aids on Natural Sciences, Mathematics and Technological Disciplines ». According to the project a number of physical laboratories of comprehensive and vocational schools of Ukraine have been supplied with patch boards «Shkolyar (Schoolboy)» and laboratory electricity measuring devices. Several educational institutions in our region received fully-equipped physical laboratories. The equipment created at Zhytomyr Ivan Franko State University and produced by the Private Stock Company «Electrovymiriuvach» has been regularly represented at the International exhibition of educational institutions «Modern Education in Ukraine». The Physics Department of the university and its Teaching Laboratory on Electricity and Magnetism created by prof. M. Tselinko serves as the scientific basis of the complex. 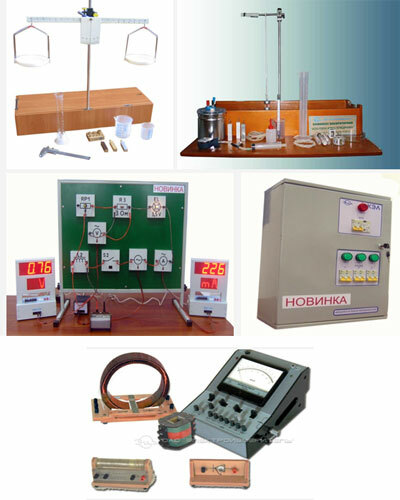 A laboratory provides the performance of 24 laboratory works with the help of Professor M. H. Tselinko’s handmade electronic measuring instruments (more than 30). The practice shows that they are reliable, sufficiently accurate and convenient during the measuring performance. A methodological complex to provide the usage of this equipment in the higher education institutes was worked out at the Physics Department. As a result it is possible to carry out 18 demonstration experiments and 16 physical practical works on the topics «Electric phenomena» (8thform), «Electromagnetic phenomena» (8th form), «Electrodynamics» (10th form), «Quantum physics» (11th form). 10 laboratory works dealing with the theme «Electricity and Magnetism» are depicted in a textbook for the students of higher educational institutions «Microcoulombmeter, Current and Voltage Calibrators in Laboratory Practice».